Home People Brilliant and Black Legendary B.B. King is Dead at Age 89! Legendary B.B. King is Dead at Age 89! 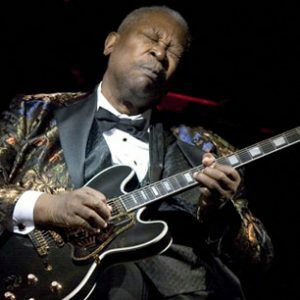 It is with great sadness that The Black History Channel announces the death of our beloved Blues Legend, B.B. King. Mr. King passed away peacefully on the evening of May 14, 2015 from a series of small strokes attributable to Type 2 diabetes. I know I say this a lot about many of the entertainers I feature here, but I grew up with B.B. King. Really, I did! I must have listened to The Thrill is Gone at least one hundred times a day during its hey day, because that’s how many times my mother and father spun that 45 and dared any one of us to talk while it was playing. I remember wondering why my parents could be so awe-struck by a song that accentuated the fact that two people didn’t love each other anymore. I also remember being absolutely certain that nothing like that could or would ever happen to me…but that’s another story! The above picture was taken in New York City on APRIL 18, 2006, at which time B.B. King performed his 10,000th concert at B.B. KIng Blues Club and Grill in Times Square. The short version of B.B.’s life is that he was a nine time solo Grammy Award winning musician who started his career in 1947. There is, of course, a long version of his life, but there’s no way to feature it here on The Black History Channel. Instead, we’ll just leave you with the following documentary and a few wonderful links to more articles about his life. Celebrate B.B. King by watching this BBC Documentary called: B.B. King: Life of Riley. And as promised, here are a few links to articles about Mr. King’s life. Next articleRainy Night in Georgia!